In what appears to be a damning indictment of the Five Year Plans, launched in 1951, as well as the economic reforms process that began in 1991, the first ever socio-economic survey has painted a dismal picture of rural India, says Devinder Sharma. What emerges clear from the first ever socio-economic survey is that for 70 per cent of India’s 125-crore population, which lives in rural areas, poverty is the way of life. Rural India is poorer than what was estimated all these years. With the highest income of an earning member in 75 per cent of the rural households not exceeding Rs 5,000 a month, and with 51 per cent households surviving on manual labour as the primary source of income, the socio-economic survey has exposed the dark underbelly of rural India. Whether it was Garibi Hatao or Shining India, all the talk of development has not enabled rural India to emerge out of poverty. Whether we like it or not, poverty has remained robustly sustainable. This socio-economic survey, undertaken for the first time in the country, defies all the tall claims made by successive governments on poverty reduction. Whichever way you measure it, and whichever way you decipher the survey findings as well as the emerging social trends, the extent of rural poverty exceeds all projections. The reason is obvious. All these years, the effort of mainline economists and policymakers has been to sweep rural poverty under the carpet. In fact, we were never honest in accepting the extent of poverty that existed in the country. It was in 2011 that Supreme Court questioned the very basis of counting the number of poor. Prior to that, no mainline economist had ever raised a finger at the artificially kept low poverty line. At that time, Planning Commission was treating those earning less than Rs 17 a day in urban areas and Rs 12 in the rural areas as living in poverty. Supreme Court’s questioning happened 60 years after Jawaharlal Nehru had launched the first Five Year Plan in 1951. In other words, for 60 years Indian planners had drawn poverty eradication programmes, sinking in lakhs of crores of rupees, not even acknowledging the magnitude of rural poverty situation they were trying to address. By keeping the poverty line deliberately low, planners were simply trying to ensure that the plan outlay for rural development was kept a bare minimum. I have always been saying that the unrealistic poverty line, later adjusted after a nationwide uproar to Rs 32 a day for urban and Rs 26 for rural areas, would not even be enough for rearing a pet dog in the cities. For the rural areas, I challenged if any farmer could domesticate a cow within a daily expenditure of Rs 26 a day. With such an inhuman poverty line I questioned time and again the relevance and purpose of the massive plan outlays which are sure to go awry. The rope to pull poor out of a quagmire of poverty and deprivation has to be long enough to reach them. It is primarily by keeping the rope short, which means by keeping poverty line too low, the 12 Five Year Plans attempts to remove poverty had failed. It is therefore time to revisit the strategy and approaches that have been followed all these years. Let’s admit our mistakes, and make a fresh attempt. Take the case of agriculture. 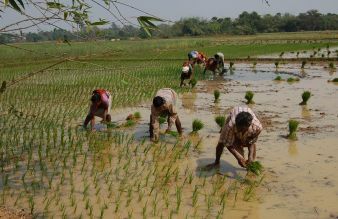 With 52 per cent of the population engaged in farming, which means 60-crore people, the government provided just Rs 1-lakh-crore in the 11th Five Year Plan, and Rs 1.5-lakh-crore in the 12th Five Year Plan. In other words, in 10 years, public sector investment transforming agriculture thereby impacting the livelihood of 60-crore people has been a meager Rs 2.5 lakh-crore. Whereas in the past decade, the industry has been given tax concessions to the tune of Rs 42-lakh-crore. This huge subsidy to the industry, if recovered, and invested in rural development programmes effectively could have wiped out poverty for 84 years as some estimates have suggested. If poverty can be removed for 84 years, I am sure you’ll agree that for all practical purposes poverty becomes history in India. Now let us look at the economic reforms. It is almost 25 years since India opted for economic reforms in 1991. In these 25 years too, rural poverty has refused to recede. Against all studies and reports that pointed to a significant reduction in poverty, the socio-economic survey openly calls the bluff. Against the expectation of the percentage of population living in poverty sliding to about 21 per cent in the past decade, this survey shows that rural poverty is much higher, exceeding 30 per cent. Even this is a conservative estimate knowing that even the revised poverty line – Rs 47 a day in urban and Rs 32 in rural areas – is not enough. Can rural India get the 'power' to choose? What could make our farmers more prosperous? In a market economy it is generally believed that poverty comes down when growth picks up. This is not true. Poverty has not come down in India in the past 10 years when the growth rate remained high at an average of 7.5 per cent. Pushing people out of agriculture, and providing job opportunities in the form of dehari mazdoor in the cities to be employed as cheaper contract labour in infrastructure projects is not employment generation. Nor is it a plausible way to pull people out of poverty. Already 51 per cent of the rural population is dependent upon daily wages. They are looking for jobs which are non-existent. Take the case of Tamil Nadu. As per MNREGA public data portal, more than 63 lakh households demanded employment under MNREGA in 2013-14. This constitutes 9 per cent of the households who are employed in manual labour. In any case, in the past 10 years, only 1.5-crore jobs have been created throughout the country against the annual turnout of 1.2-crore people who become eligible for employment. In an era of jobless growth, the findings of the socio-economic survey needs a proper assessment and an honest appraisal. To use it to justify the push for a higher economic growth as the way forward would be a grave mistake, a historic blunder. The author is a food and trade policy analyst and chairs the New Delhi-based Forum for Biotechnology & Food Security. His blog, Ground Reality can be read at http://devinder-sharma.blogspot.com. There are more things in heaven and earth than stock markets!